As technology workers, we all face the challenge of IT being perceived as a cost center. The work is done in other departments but IT provides the tools to make that work easier, faster, and more efficient. Communicating the results of any IT project back to the business should happen throughout the project life cycle, thereby transforming the role of IT into a trusted business partner. Companies who can integrate the right technology at the right time will have an edge on their competition. As IT delivers against objectives to increase efficiency and productivity company‐wide, the real value of IT becomes apparent when your investments show a return while your competition is throwing money at problems. Measuring success starts with clear data measured against specific criteria. ITPM and its components will provide data back to the business and deliver it as information that is valuable to the viewer. IT departments collect, manage, and present data as well as maintain the tools and systems that increase the speed and efficiency of business transactions. Because of IT's daily interaction with vendors, help desks, and programmers, the language and perception of IT workers becomes technology‐centric. I have even heard quips at social gatherings where IT people claim to speak two languages: English and IT. The same thing is true for any other department, as every department develops its own specialized terms. However, IT permeates an organization more than most other departments. This may be caused by the unique position IT is in‐ they support every department within an organization and have a direct effect on everyone's ability to do their job. In order to create positive change, IT must provide information in a format their customers can understand. Many organizations use a "portfolio view" as a means to communicate. The concept is generally understood by business executives, and it provides a single view into the priorities that have been set by the business and the health of the work being done. This portfolio view applies equally to investment decisions, projects, and applications, all of which are relevant to the business user. By collecting user feedback, demonstrating positive action, presenting objective data, and fostering collaboration IT can be seen as a contributor to the organization. I have worked with several program managers who were responsible for large federal contracts. The data these managers need to do their jobs is usually task‐driven and deadline‐oriented. Program managers report to a division manager who tracks cost and return across multiple contracts and reports to the CFO. One program manager I was working with had an internally‐developed ITPM system in place. This application gave the program manager and the division manager the same view into the data. There were multiple links and applications that showed similar data sets on different dashboards. I remember watching the program manager sitting at her desk and clicking through several links. Then she opened Microsoft Outlook and went through her tasks for the day. When I asked her "How do you keep track of all this stuff?" I got back a tight‐lipped response of "poorly." She was looking at Gantt charts, calendars, and progress reports from sections of the program she was managing. Using multiple systems and manual tracking gave her a very low opinion of IT. The only way to change her perspective was to give her the data she needed and reduce the effort required to organize her day. As you can imagine, the developers and support personnel for this application knew an incredible amount about writing code and troubleshooting desktop problems. If they were asked why so many different applications were required, the response was always "that's how it's built." This IT department was focused on delivering all the data instead of the right data. Here was an opportunity to elevate IT by providing specific data that can be consumed by the business while at the same time supporting a system that drives business goals. If this company's IT department had been able to collect and compare feedback from the program managers, they would see an immediate need for change. If you manually manage your application portfolio, the corporate‐wide perception of IT will rapidly deteriorate. Even with an automated Help desk system, all you can view are trends related to specific systems. I have never seen a trouble ticket that reads "the user must open too many applications to effectively do his job." What if your users suddenly discovered that they could contact IT with an idea that would make their jobs easier and something positive happened? Collecting and acting on user feedback as you drive your application investments will always elevate the perception of IT. You can use surveys, employ application scorecards, and track feedback trends to make a positive impact. What's more, using a portfolio view can show business executives the direct impact of IT on the issues that are important to them. If you can see where the money and resources are being spent, including what strategies are being advanced as a result of the investments, it is much easier to guide your business. If IT has a real‐time view into resource allocation and can clearly see the impact of any change across the organization, then IT can be an enabler instead of a roadblock. One goal of ITPM is to easily show the other executives what value is being delivered for their IT investment, rather than only seeing an expense. Executives have very little time to sort through data. The idea of creating a "bullet list" to present to decision makers is already a source of thousands of corporate jokes. Inevitably, one of the bullets is questioned by a CxO, and you schedule the next meeting to back up your findings. This becomes an endless cycle of creating arguments, presenting perceived facts, and backing up your claims. In a centralized management system, the information on the screen is directly linked to the supporting data. This allows executives to drill down and see objective data used to make decisions, without personal agendas coming into play. In order to elevate IT in the eyes of the executive team, you have to avoid getting caught in the middle. There is no better way to do so than by making sure your peers have instant access to any level of information they need without attaching a personal interpretation. Personal agendas are part of everyday human interactions. Unfortunately, this doesn't always result in decisions that are best for the business as a whole. To avoid this situation, you should present neutral data without personal interpretations. With ITPM, you can use the information from dashboards and reports to reduce the number of personal interpretations and subjective data from your decision‐making process. If technology is considered an obstacle in your organization, it is most likely due to inaccurate or incomplete information. Business leaders are concerned with market positioning, ROI, and financial returns. If you manufacture and sell widgets, how can technology be a profit center? Having an accurate view of the cost of IT services will illustrate the hidden value of IT. What metrics are important to your CFO in terms of understanding the return on IT investment? Is your company managing your IT resources with a TCO model, or is the ROI across the board a more important measurement? Have you started investigating IT cost transparency solutions to uncover all your technology expenses? Regardless of the metric, CIOs and even some directors must have a deep understanding of how your company tracks and measures results. You have to match your IT metrics with the metrics used in the rest of the company's portfolio. Two very basic examples of these financial metrics are TCO and ROI. TCO tries to illustrate the total cost of an asset based on its lifespan or on a fixed period of time. Companies who use TCO are trying to put solutions in place that require minimal reinvestment and will last as long as possible. The idea is to add it all up and manage to the lowest number. In this environment, you should illustrate the costs associated with every aspect of your project: Installation, labor, equipment costs, support, and maintenance are just a few of the variables in this equation. Without an ITPM solution, many of the numbers you need are merely guesses. ROI has been a model for measuring success for years. From a financial perspective, ROI is the money returned on any investment. When you are estimating ROI, there are two types of costs and returns: hard and soft. A hard cost or return is the term for actual dollars spent or revenue received. Soft costs and returns are measured by assigning a value to something non‐monetary or difficult to track. An example of a soft cost is an increase in customer service time that reduces productivity. If you are managing to this metric, it is important to be as accurate as possible when determining benefits you gain from IT investments. Regardless of how you measure your returns, it is important to remember that ITPM and the information it provides can influence corporate investment decisions. Providing transparency into the cost of IT services will help to influence demand. "Customers" understand the budget they have available, and the concept of "choosing to buy" absolutely influences their behavior and interactions with IT and its services. Here, when services are perceived as "free," demand becomes unlimited. At a very high level, determining cost of resources sounds simple. Take the loaded salary of an employee, divide it by the number of hours in a year, and you know how much that employee costs per hour. If you use this basic equation, how do you account for actual productivity? Is there any way to tell when you have an employee who may be doing work that requires less training but is producing twice the results? Can you look at your available resources and determine whether it is economical to bring in a contractor? The true cost of IT services will obviously vary. However, employees, applications, and support costs generally tend to trend in certain directions. Without ITPM, there is no objective way to determine these true costs. For example, many large organizations have legacy applications that appear to be stable. Often, there are only one or two employees who support these applications and can keep them running. If this is the case in your organization, do you know how much this system is costing you? Do you have the means to view application performance, user productivity, and employee support costs over time? Most of these applications just keep running along under the "If it ain't broke don't fix it" policy. Over time, they become "money pits" because the executive team has no way of seeing the true cost of the system. When those costs are finally revealed, CIOs can find themselves in an untenable position, and in the worst case, looking for a new employer. Communicating accurate returns on IT investments to executives is the role of the CIO. You can use ITPM to illustrate resource utilization and translate that information into dollars. Communicating the financial benefits of IT is how you can improve the business whether you manage to ROI, TCO, or some other model. Technology has significantly changed the business world in the past 10 years. If trends are any indication, changes will continue to accelerate and drive business ever faster. CIOs are in a unique position because their department is no longer just a cost center but a business enabler. As the role of technology in business changes, CIOs must also change. CIOs need to be responsible for managing IT investments, providing data to illustrate ROI, and providing useful information to drive business decisions. ITPM solutions can give you the tools to transform the CIO into this trusted advisor role, acting as more of a consultant to the business. The word "consultant" can have a negative connotation. Some people think of them as experts you pay to tell you what you already know. However, professional consultants are aware that the way to maintain a profitable business is to provide value for every dollar spent. In the future, the only real difference between a CIO and a top‐dollar consultant will be hourly billing. This change will take the focus off implementing technology for technology sake and move it to improving the business. In effect, IT spending will become an investment, and the CIO will be responsible for illustrating a return. CIOs must manage IT investment data and provide useful information to every aspect of the business. Companies must find a way to increase productivity from constantly shrinking resources or tap into budgets in other areas. Professional consultants do this on a daily basis. One of my former customers was a boutique bank for the wealthy. Their business model combined top‐notch customer service and investment banking. While I was meeting with the CIO to discuss server‐based computing, the topic of IT security came up. The marketing director was sitting in on the meeting, and mentioned that she wanted their customers to feel like their bank was more secure than most. This particular CIO was a very savvy business person, and she picked up on the comment immediately. She turned to my team, and said "I have heard about second factor authentication, and I think I understand it. Could we put branded tokens in the hands of our customers and make them feel safer?" After a few minutes of discussion, she called the CFO and the bank President and asked them to join us for 5 minutes. With minimal information, she created an ROI for her peers. My team was stunned. We had met with her to start defining project criteria for server‐based computing, and now that project was being placed on the back burner. However, after the 5‐minute meeting with her peers, a new project was in the works. When I asked later about how she was able to do this, I was amused by her answer. "I got lucky; all the pieces just fell into place. I just wish I had a way to find this stuff other than random chance." I haven't spoken to this CIO in 3 years, but she is still at the bank and they have continued to grow in a weak economy. I would be very surprised if ITPM is not already in place, or at least in the works. Her comment to me about "getting lucky" really drove home the point that in most organizations, success from IT depends on luck. This particular CIO was savvy enough to see an opportunity without hard data. I am sure that she would be the first to tell you that eliminating that moment when "all of the pieces (luckily) fell into place" and replacing it with proactive information to make informed decisions would change her entire approach. Combining the knowledge of how technology and business work together is a rare trait. It's easy to get distracted and shift your focus to the functional details of specific projects. As the CIO, you are the person in your organization who should have a detailed understanding of why. I am not diminishing the role of other positions. Project managers and technology specialists have an in‐depth understanding of their work, and they focus on those areas to be the best in their field. The role of the CIO is managing business investments, so you have to understand how your business works to be the best in your field. Earlier in this chapter, I wrote about financial metrics and how important it is to understand what is important to your peers. Do you think a network infrastructure specialist or a programmer is concerned with the company's financial metrics? In the past, financial data, project schedules, and demand management were all tracked manually in separate applications. Now, CIOs can use ITPM data to increase collaboration and provide their companies with a competitive advantage. Most of the time, business is about making profits and outperforming your competition. Installing new production equipment or targeting new growth markets are two simple ways to increase profits. However, if any investment is easy, your competition is probably already working on it. The opportunity in IT is simple to explain and difficult to complete. It is the CIO's job to collaborate with the executives to help transform the business using the power of IT. Fulfilling the role will be next to impossible without a portfolio management solution in place. Once you have centralized data and can manage to business and financial metrics, you can foster executive collaboration and steer the company to the profits. The current workload has increased so much that without the right tools, executives simply can't keep up with all the work. Communication is becoming less frequent, and executives find themselves "on their own" when making critical decisions that can impact the entire organization. A single decision maker might be more efficient in terms of allocating executive resources, but can your company really afford to risk poor investment decisions? This is one of the best opportunities for the CIO to elevate IT. In order to illustrate increased efficiency, you must have—and use—the tools that make collaboration possible. If you can use the tools to make communicating easier, you will have a positive impact on every aspect of your company. An ITPM solution provides benefit at all levels of the organization. It would benefit anyone to walk into the office and have visibility into the information that can help them perform better on that day. Most people use Outlook tasks, MS Project, or even pen and paper to outline daily activities. Everyone does their best to make sure they are focused on the correct activities. However, personal interpretation, emotion, and even physical well being can shift priorities. One way to keep people focused on the right objectives is to tie them to the business and illustrate their benefits. If you had a tool that could highlight your priorities and outline your day, you can save time and be more effective regardless of your corporate role. If you are task driven, a list of tasks that are focused on the right activities would increase your productivity. If your role is maintaining portfolio health and maximizing ROI, you need to be directed to the issues that directly impact those metrics. Dashboards created for specific roles such as a project manager or a CIO will organize your day and help you stay focused. Figure 5.1 offers an example of a role‐based dashboard that can accomplish exactly this. Figure 5.1: Examples of a project manager's desktop and a CIO's desktop. Tracking your day automatically and focusing on the correct objectives reduces the workload and increases productivity. Communicating this positive impact of ITPM is key to getting buy‐in from your peers. For example, one of my customers who had been using ITPM for about two years called me in for a meeting. It was only scheduled for 30 minutes, and he wanted to discuss a single sign‐on solution. As I was driving in, I was trying to figure out how I was going to ask the right questions to uncover his pain points, get the information I needed, and set the next meeting. When I made it to the conference room, the HR manager was there, along with the CIO. After I had asked my second question about the difficulty they were having, the CIO held up his hand, signaling me to stop. He handed me a stack of papers and started talking, "We've noticed that when we terminate an employee, it takes about a week to track down every system that employee had access to and lock them out. What you have in your hand is a list of technical criteria for what we need, and a workflow diagram. I highlighted the steps in the process that we have to go through for this, and having worked with your company before, I understand what you do. You have a checklist for the documents we need from you, and contact information for the people on the workflow diagram. My CFO needs costing and lease options; the security specialist needs to know how the system works and if it's certified. You can send your references to Linda the HR manager. Do you have any questions?" I had hoped to meet with this person, and spend time extracting his pain points and learning the process. Usually those discussions end with a second meeting scheduled to dig into the solution. The process takes about 4 hours, spread across two meetings. Instead, when I walked in, I had 90% of all the information I needed handed to me in a folder. I could go back to my office and go straight to work. It saved an immense amount of time for everyone involved, including the HR manager, who later told me how this meeting came about. The following week, I took the HR manager to lunch. She explained that the CIO had approached her a month ago with specific questions. Apparently, too much time was spent tracking down the credentials of former employees. Also, two of the systems related to HR had slowed considerably and were crashing on a regular basis. The CIO was able to drill down into the application scores, and correlate the scores with multiple requests for new server hardware. He then contacted all the departments involved and showed the other executives his performance metrics and how they were impacting the bottom line. From this point, it was an easy decision to invest in new systems and replace multiple servers with virtual machines. In essence, this company used ITPM data to solve a specific business issue and to invest in a new technology that would save even more money. In less than a month, the CIO had everything he needed for every decision maker in every department. All because the vendors who walked in the door left with a clear, concise picture of what they had to provide. Ask yourself if you could do the same with the systems and processes you have today. There is no better time to start tracking and managing your IT portfolio. The economic downturn is bottoming out, and companies are starting the growth cycle again. If you can position IT as a business contributor and clearly illustrate a positive return, you can be ready to help your company take advantage of the next economic cycle. IT departments without ITPM in place have been providing value by stretching resources to the limit and cutting costs. Still, they have managed to keep technology operational. With all of the effort focused on technology and operations, communication with the business stakeholders has been sorely neglected. By design, a CIO's executive peers are strongwilled individuals who quickly understand any situation and take immediate action. When executives view technology as a utility, it is difficult for a CIO to be taken seriously. The only way to elevate IT in this environment is to communicate the value of IT to the business stakeholders. If you can show how to strategically invest resources, improve financial metrics, and accurately forecast IT supply and demand, you can become an integral part of the executive team. CEOs are primarily concerned with guiding the company; thus, they are constantly looking for new ways to improve the business. Taking advantage of a market opportunity or responding to a competitive move is their primary focus. When you sit down with a CEO and start discussing productivity, you may have his attention, but only briefly. If you can change the conversation to a discussion of competitive advantage and strategic planning, you will have a much better chance at getting his support. 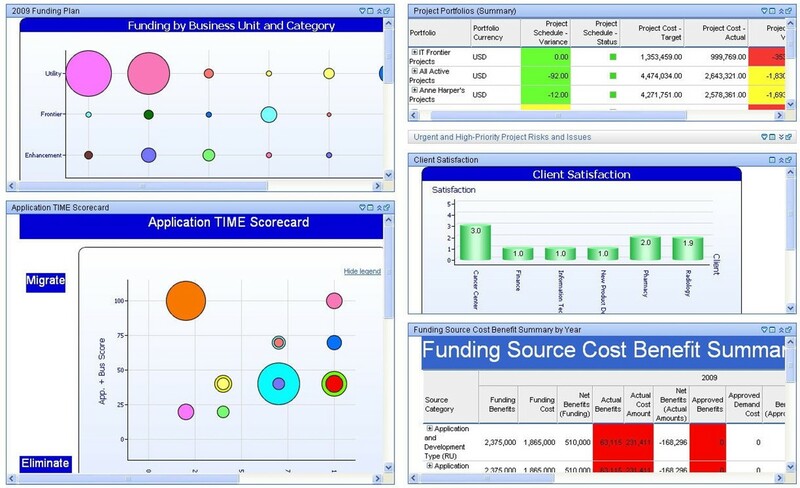 A basic way to illustrate how ITPM will benefit your organization is explaining to the CEO that this tool will help classify IT projects and make sound investment decisions. Simple graphs, like the one Figure 5.2 shows, will illustrate the value of ITPM to your executive peers. Figure 5.2: How ITPM classifies investments. Strategy and market position are the focus of the CEO. The easiest way to communicate the value of IT is to show how innovation capacity contributes to these. If your CEO sees IT as an expense, you must show them how operational demand is consuming critical resources and how increasing innovation capacity gives the company a competitive advantage. ITPM can help you reduce unnecessary operation expenditures in favor of investing in innovation. If you want to focus on outperforming your competition, you need to use technology to your advantage in the market. ITPM will allow you to focus on projects that are linked to strategic goals and explain how they will bring about positive change. If the discussion continues, you can move to the various aspects of demand management and point out how a comprehensive view of resources and work will allow you to intelligently shift IT supply to provide business agility. Eventually, it will become apparent that ITPM is one of the tools you need to empower IT for that strategic contribution. By sharing IT results in business terms, the hidden value will become apparent. Every company is concerned with profitability. CFOs are perpetually moving money from one budget or investment to another to get the highest returns. Technology is usually viewed by CFOs as a tool to make employees more productive. When the technology doesn't work the way they expect it to, IT takes the blame and is usually asked, "What are you doing with all the money we give you?" The key to communicating with a CFO is to answer that exact question, in terms they can understand. To illustrate IT's value to a CFO, you must show some type of return on the investment. If you answer the question about where the money went by pointing at his phone or computer, you are actually hurting your cause and enforcing the idea that IT is a cost center. What if you could answer that question by showing a graph illustrating a reduction in employee turnover since the new call center was installed? Or maybe a steep reduction in RMA processing after you implemented the new Web‐based ordering system? These metrics are usually available somewhere in the corporate data pool, but how can you easily extract them? If you want to show the CFO the value of IT, IT investments should be tied to expected benefits. The ITPM conversation with the CFO will usually begin with a CFO seeing just another request for more money. This is an open door to ask about the specific metrics and the expected returns from different business units. You may be surprised to learn what divisions are considered a cost or profit center. Once you have this information, you can point out how ITPM will allow you to establish direct relationships between money invested in technology and financial returns. It is crucial to have buy‐in from the CFO for an ITPM project to ensure that the tools you are investing in will provide the correct data. This discussion can lead right into the topic of accurate forecasting. Investments such as those in the stock market have a fairly large risk factor. Stock markets have many elements that are beyond the investors' control. Millions are spent each year by brokers, entrepreneurs, and analysts to forecast which way the market will go. For this type of investor, minor changes in the market can have huge repercussions. Although this is true for any type of investment, the risk involved in an IT project is much easier to predict and control. Unlike stock markets, IT investments can be tracked and measured, and executives can focus directly on producing results. Using what‐if scenarios and constantly re‐working schedules can tell you when you need to invest in more people. The tools provided in an ITPM solution can turn IT into a much safer investment area for your organization. Illustrating the value of IT is at the core of the CIO position. Once you and your colleagues understand how crucial IT investment is to the overall health of the company, you can make positive changes. IT has grown from a utility into an enabler, so many executives have preconceived notions of what IT really does. If you can use the tools to extract and illustrate the right data, you will become a high‐level business partner, guiding your company to financial success. An IT Portfolio Management solution is one of the most valuable investments a CIO can make. I have watched technology evolve over 15 years, and still, IT is viewed as a utility. Successful companies continually invest in technology that supports their business goals. ITPM will reduce the risks associated with technology investments. The role of the new CIO is to challenge the existing paradigm, enable collaboration amongst your peers, and take responsibility for improving your organization. IT budgets and technology resources are continually shrinking. IT departments are losing skilled employees due to increased stress and unreasonable workloads. The only person in a position to change this and move away from IT as a utility is you. If you allow yourself to be forced into the role of a technical advisor, investment decisions will continue to be made by people with no visibility into the business impact. Implement the tools you need to collect and compare investment data. Present yourself as the business consultant who is guiding your technology investments and focus on the business of technology. You have to turn technology data into corporate information to show value to the business and collaborate effectively with the executive team. CEOs and CFOs are busy, dynamic people who are focused on their roles. If you are lucky, you can get 15 minutes on their schedule to have a discussion about what you need. To collaborate with executives, the discussion must be about what they need. The clearest path to altering the discussion is through ITPM. You can avoid conflict and steer investments with objective data. You can put information into a format that can be understood at a glance, and save time for your peers. If you can get your business to understand the strategic role of IT, you are creating a win‐win scenario for everyone involved. Project managers, program managers, and implementation personnel are so overloaded that they must focus on the task at hand to succeed. These roles frequently have no access to executive decision makers, other than the CIO. If CIOs don't act as conduit for positive change in IT, who will? You have to understand the business impacts of your investments and move IT into the decision‐making process. If you don't, the competition will find a way to use technology to surpass you. The guidance of a strong CIO with the right tools can be the most valuable asset in any organization.